The script works for Raven/Crow too, but I think most models are quite different from the playable characters. The script works with Model Researcher Pro. 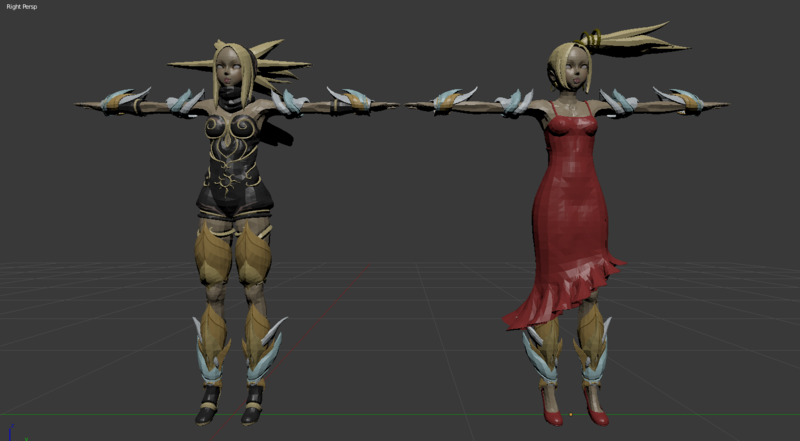 I want to fine-tune it so that there aren't any errors or missing faces, but I also want to try to get the bones, which are in separate files (.mot) and must be assigned weights when the models are loaded in-game. The only problem with that is that I'm not entirely sure how the bone data looks in a hex file, or if I can use Model Researcher to visualize them. I may have to write a Blender script for this sooner than I'd hoped, haha! If you guys know a thing or two about ripping bones and weights, please do tell. #we gotta create the meshes. #the vertices, faces, and uvs. #vertex blocks are 36 bytes, not 32. #starting at the right place. #peek 31 (0x1f) bytes ahead. #step back 31 bytes and read 16 times. #the last half-float. That's enough info to continue the loop. if vertexType == 40: #we've found a lowpoly model. submeshes are separated by zeros. #make sure to use only the first third of the faces array. If you get the animation, please let me know. I plan to add to the program to support skeletal animation. (07-02-2018, 05:45 AM)Lazov Wrote: If you get the animation, please let me know. I plan to add to the program to support skeletal animation. Alright. I'll keep you posted on any developments.